In its efforts to broaden ICT literacy, the Center for Information Technology and Development (CITAD) has since 2001 been conducting Annual Information and Communication Technology quiz competition for secondary schools across Kano State. The annual competition was initiated to promote ICT knowledge among the secondary school students in order to ensure that they meet the growing demand for ICT literacy. This year’s quiz marked the 15th round in Kano State after its inception in 2001. 34 secondary schools participated which took place on 24th November, 2016 at School of Technology, Kano. The quiz started with opening remarks by the representative of CITAD Executive Director, Malam Ahmad Abdullahi Yakasai who emphasized the importance of ICT education and briefed the audience about the aims and objectives for organizing the ICT quiz among secondary schools in Kano State. He then listed the following prizes to be won during this year’s ICT quiz competition. 7. 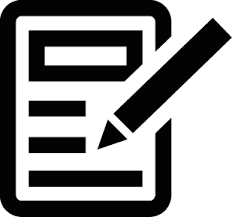 Participated Teachers and Students: Certificate of participation and set of books. In his good will message, His Royal Highness, the Emir of Kano Malam Mahammadu Sunusi II who was ably represented by the district head of Dawakin Tofa, Madakin Kano, Alh. Yusuf Nabahahani Ibrahim acknowledged the developmental activities of CITAD in the state. He then stated that, the emir wishes to attend the ICT quiz competition himself in order to motivate the organizers and the participating schools in this worthy endeavor but due to certain reasons he assigned me to represent him. He finally thanked CITAD and wished them God Blessings. The yearly quiz also was attended by important personalities which included His Royal Highness the Emir of Kano Malam Muhammad Sunusi II who was represented by Madakin Kano and District Head of Dawakin Tofa Alhaji Yusuf Nabahani Ibrahim Chigari, Vice Chancellor, Bayero University Kano, Professor Muhammad Yahuza Bello also represented by Dr. Muhammad Ajiya, Director, Center for Information Technology of the university, Commissioner of Commerce, Tourism and Industry also represented by Alh. Danjuma Babawo, representative of the Regional Manager, Nigeria Social Insurance Trust Fund (NSITF) Alh. Waziri Ibrahim, representative of the Managing Director, Intersystem Institute of Information Technology, Alh. Muhammad Auwal. Others were Mr. Kinsley Iwezulu from H&M Construction Company Limited, representative of the Executive Director School of Technology, Kano, Engr. M.M Kibya, Executive Secretary Isa Wali Empowerment Initiative, Hajiya Amina Hanga, Alh. Murtala Bala Mai Sallah, and Salisu M. Indabawa, representative of the Executive Director United Action for Democracy (UAD), Media Organizations and Civil Society Organizations. Engr. Kamal Umar of CITAD who served as the quiz master declared the quiz open by stating the rules and regulations governing the quiz competition for the participating schools. First round of the quiz featured 17 schools on the first come first serve basis. The schools were: SAS, Kano, GGASS Albasu, MTGSTC, Kano, GGC Kano, GGSS Kabo, GTC Danbatta, GGSS Kura, GGSS Jogana, GSS Gwarzo, GTC Kano, GSS Rano, GGC Gezawa, GSS Shekara, GTC Ungogo, SBSC Dawakin Kudu, GGSS Fatima Muhammad and Governor’s Collage, Kano. The quiz master asked the schools to answer three questions each and each question carries 2 marks. SAS, GGASS Albasu, GGC Kano, GGSS Jogana, GSS Rano, GGC Gezawa and GGSS Fatima Muhammad answered only one question and scored 2 marks each. 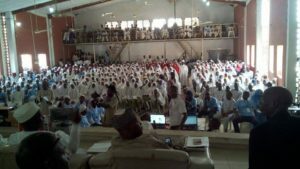 MTGSTC, GGSS Kabo, GTC Danbatta, GGSS Kura, GSS Gwarzo, GSS Shekara and Governor’s Collage, Kano answered 2 questions and scored 4 marks each. GTC Kano, GTC Ungogo and SBSC Dawakin Kudu answered all the 3 questions and scored 6 marks each. This means that GTC Kano, GTC Ungogo and SBSC Dawakin Kudu emerged victorious and able to secure a place in the final round. The second round also featured 17 schools, the schools were: GGSS Sharada, GTC Bagauda, GGASS Maryam Shekarau, GSS Karaye, GC Tudun Wada, Day Science, GGASS Tahir, GSS Sabuwar Kofa, Dakata Kawaji, GGSS Yar Gaya, Rumfa Collage Kano, GGSS Hausawa, GSS Danbatta, GGAC Goron Dutse, GSS Bichi, MSSC Gaya and 1st Lady Collage. GGASS Tahir, GSS Danbatta and GGAC Goron Dutse couldn’t answer any question and got nil. While GTC Bagauda, Dakata Kawaji, GGSS Yar Gaya, Rumfa Collage, Kano, GGSS Hausawa and MSSC Gaya answered only one question and scored two marks each. GGASS Maryam Shekarau, GSS Karaye, GC Tudun Wada, GSS Bichi and 1st Lady Collage answered two questions and scored 4marks each. GTC Bagauda, Day Science and GSS Sabuwar Kofa answered all their questions and scored 6 marks each. This also means that GTC Bagauda, Day Science and GSS Sabuwar Kofa that answered all their questions and scored 6 marks each will meet GTC Kano, GTC Ungogo and SBSC Dawakin Kudu in the final round of the quiz. The final round of the quiz competition was very excited because there was a tie. GTC Kano and SBSC Dawakin Kudu answered only one question in the round and scored 2 marks each, while GSS Sharada couldn’t to answer any question. The schools that had the tie with 6 marks each were GSS Sabuwar Kofa, Day Science and GTC Ungogo. In view of this, Alh. Muhammad Auwal of Intersystem Institute of Information Technology who served as the chief judge of the competition instructed the quiz master to give additional question to the schools that scored 6 marks each with purpose of getting 1st place, 2nd place and 3rd place position. GTC Ungogo failed to answer its question in the additional round while Day Science and Sabuwar Kofa answered their questions. Automatically, GTC Ungogo emerged 3rd place position. Day Science, Kano and GSS Sabuwar Kofa were given another chance in order to have the 1st and 2nd place position. At the end, Day Science Kano that able to answer its question emerged victorious and won 1st place position while GSS Sabuwar Kofa won the second place position. Before presentation of the prizes to the winning schools, Executive Secretary Isa Wali Empowerment Initiative, Hajiya Amina Hanga expressed dismay on the performance of girls secondary schools that took part in this year’s quiz. Stating that as an advocate of the woman rights she was not happy to see that no girls’ schools emerge winner of any position. She said that Girls Secondary Schools took 50 percent of this year’s ICT quiz but unfortunately they couldn’t succeed to even participate in the final round of the quiz. She finally urged them to try in the next year’s quiz competition. Representative of the Regional Manager, Nigeria Social Insurance Trust Fund (NSITF) Alh. Waziri Ibrahim presented a laptop to the 3rd place position GTC Ungogo. While Executive Secretary Isa Wali Empowerment Initiative, Hajiya Amina Hanga helped to present a laptop and 3-in-one printer to the 2nd place position and Vice Chancellor, Bayero University Kano, Professor Muhammad Yahuza Bello who represented by Dr. Muhammad Ajiya, Director, Center for Information Technology of the university presented a laptop and Refurbished computer to Day Science, Kano who won the first place position. Malam Kabiru Sa’id Dakata, Senior Program Officer, Center for Information Technology (CITAD) made the vote of thanks. He thanked the representative of the Royal Highness the Emir of Kano Malam Muhammad Sunusi II who was represented by Madakin Kano and District Head of Dawakin Tofa Alhaji Yusuf Nabahani Ibrahim Chigari, Vice Chancellor, Bayero University Kano, Professor Muhammad Yahuza Bello represented by Dr. Muhammad Ajiya, Director, Center for Information Technology of the university, Commissioner of Commerce, Tourism and Industry represented by Alh. Danjuma Babawo, representative of the Regional Manager, Nigeria Social Insurance Trust Fund (NSITF) Alh. Waziri Ibrahim, representative of the Managing Director, Intersystem Institute of Information Technology, Alh. Muhammad Auwal, Mr. Kinsley Iwezulu, H&M Construction Company Limited, representative of the Executive Director School of Technology, Kano, Engr. M.M Kibya, Executive Secretary Isa Wali Empowerment Initiative, Hajiya Amina Hanga, Alh. Murtala Bala Mai Sallah, Salisu M. Indabawa, representative of the Executive Director United Action for Democracy (UAD), media organizations and civil society organizations. He also thanked teachers, the students and those that assisted CITAD by giving different prizes and everybody that contributed in conducting the quiz directly or in directly. He thanked the representative of the Hon. Commissioner Ministry of Education Kano State, representative of the Director General Kano State senior Secondary Management Board, representative of the Managing Director Abubakar Rimi Television, representative of the Chairman Parent Teachers Association, Members of the Press, Security Agents, Teachers and Students. He also thanked those that assisted CITAD by giving different prizes and everybody that contributed in conducting the quiz directly or in directly.